Breaking up Hewlett-Packard is “totally the right thing to do for this company,” CEO Meg Whitman said Tuesday, after HP reported declines in revenue and profit for the last quarter. “We’re going to make more progress as separate companies than as two companies together,” Whitman told financial analysts on a conference call. But it’s a monumental task—“the biggest separation that’s ever been done,” according to Whitman. And it’s not a typical break-up, where a company spins off a small part of its business. Each of the new HPs will be a behemoth in its own right, with about $57 billion in revenue. HP announced last month that it will divide itself in two by around this time next year. One company, HP Inc., will sell its printers and PCs, while the other, Hewlett-Packard Enterprise, will sell its data center products and services. Around 400 to 500 executives will manage the split, Whitman said Tuesday, while the other 275,000 employees try to get on with running the company. “We’ve got deadlines every month on decisions that have to be made and operations that have to be changed,” she said. HP has 786 legal entities around the world, and each needs to be “rationalized” and studied for the legal and tax ramifications of the breakup. Still, she insisted it’s the right course. By splitting in two, the rationale goes, each company will be more focused on the products it builds and the customers it serves. And it gives HP a chance to review “every line item” and reshape the new companies almost from scratch. She didn’t say why her thinking changed, but HP’s results have improved little since that time. On Tuesday the company reported a 2 percent drop in revenue, to $28.4 billion, its 12th quarterly decline in 13 quarters. Profits were also down, by 6 percent, even though HP has cut 45,000 jobs to reduce its costs. Excluding some one-time items, its earnings climbed 5 percent to $1.06 per share, in line with its forecast. HP’s huge PC division continued its growth spree, with sales up 4 percent. But that division has benefitted from businesses that were slow to upgrade from Windows XP, and most of those upgrades are now complete. The company’s printer, server and storage divisions all reported declining sales, with networking the only other bright spot. HP increased its spending on research and development by 10 percent this year, Whitman said, and it’s been innovating on several fronts. Its Sprout PC broke new ground in 3D printing and touch computing, and it’s designing a whole new type of computer architecture called the Machine. But it’s unclear when those and other initiatives, like its low-power Moonshot servers, will pay off. 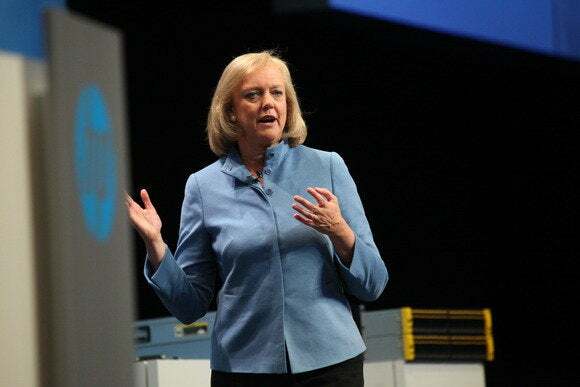 At one time, Whitman predicted a return to growth for HP in 2014, but that hasn’t happened, and on Tuesday she said it probably won’t happen in 2015, either. So HP is starting the fiscal year with its work cut out for it—even without the distraction of breaking up the company. Customers and employees are “excited” about the split, according to Whitman, but big structural changes rarely lead to increased sales in the short term—just ask Dell.